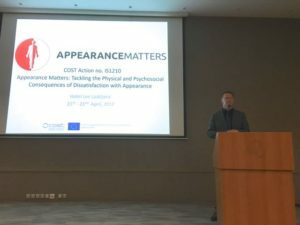 The Cost action IS1210 had their final conference- An International Conference about the Impact of Appearance in our Society held in Ljubljana| Slovenija 20th to 22nd April 2017. Dr. Martin Persson, Thomas Nilsen and Ingrid Øverbø from Triskelion participated. Thomas joined the presentation from work group 4-“Understanding health behaviour and body image among university students – a cross national comparison” and EU funded projects on developing training materials for vocational sector. A full 3 days of very exiting presentations and key note speakers: Ron Strauss from USA, Clare Chambers from UK, Anna Faustova from Russia, Zali Yager from Australia and Elena Rossini – filmmaker from Italy.